This year we are proud to have the following Guest Speakers: Dr. Phyllis Baker- Professor Emeritus of the Social Sciences, at the Wolfson Campus of Miami-Dade College. Annette Corbett Gardiner, MHRM -President/Founder P-TEEN Achievers’ Network, Inc. , Jackie Darville -School Guidance Counselor/ Mindful Instructor, Elena Justice -Certified Les Brown Maximum Achievement Team training Coach, Public Speaker and Trainer. Yvonne P. Morris- Author and Director Wellness, Nzingah Oniwosan-Yoga Teacher, Raw Vegan Chef, Scientist, Healer, Rocki Roland-Motivational Speaker, Yoga Guru, Pranic Healer Dr. Rev Alma Stevens – Director, Counseling, Karen Watts -Founder and consultant at Edpressions Consulting – Education Services and Edgar Wright – CEO and Founder Wrightway Media Services LLC. This year, Dreamcatchers for The Soul’s 6th annual Lotus Workshop, will go beyond the dictionary meaning to make our children—and their families too—aware of the truth that INTUITION is not just a “woman’s thing”. It is a Divine Power; a built-in GPS given to all of us to help us find our way. No te pierdas del gran concierto de Paquita la del barrio junto con los invitados especiales KerreKe y Carolina de La O. A cantar a todo pulmón los grandes éxitos Doña Paquita: ” Rata de Dos Patas” “Tres Veces te Engañe” “Pierdeme el Respeto” ‘Me Saludas a la Tuya” “Que me perdone tu perro” entre otras. Nota: La fecha del concierto fue reprogramada del 5 de Mayo al 25 de Mayo. Los boletos originales serán honrados para la nueva fecha.Reembolsos disponibles a pedido en el punto de compra. Giving a nod to Stevie Wonder’s album “Songs in the Key of Life,” America’s Got Talent favorites Sons of Serendip honors the legendary singer-songwriter with this exciting new show. Their unique soulful pop and classical cross-over sound blends beautiful vocals with guitar, piano, harp and cello, creating musical moments that touch the heart and lift the spirit. Watch the Miami HEAT take on the San Antonio Spurs! Join the official Miami HEAT Road Rally at Bokamper’s Sports Bar & Grill on December 6, 2017. Cheer on our home team alongside HEAT Dancers, Burnie and other HEAT Lifers! The event, sponsored by Bacardi, will feature drink specials, giveaways and Bokamper’s award-winning ribs. •	All Day Happy Hour from 11:30 a.m. to 7 p.m. The yacht is operated by New York Cruise Lines, parent company to the iconic Circle Line Sightseeing Cruises, as well as the award winning lobster shack North River Lobster Company. New York Cruise Lines also operates World Yacht, a luxury special events and private charter business, The BEAST Speedboat, a summer time thrill ride, and Circle LIVE, a live music series. The company is located in Hudson River Park on 42nd Street and the Hudson River, convenient to Times Square, the High Line and Hudson Yards. Saturday February 11 2017 at 8:00 PM – come hear the sounds of jazz and R&B with Soul Train Award winner Nicole Henry, sure to set the mood for Valentineâ€™s Day. Ms. Henry has captivated audiences while establishing herself as one of the jazz world’s most acclaimed vocalists. Her expressive, soulful voice and uplifting energy has earned her three Top 10 U.S. Billboard jazz albums along with international accolades from Moscow to Madrid. Adding to her vocal talents, Henryâ€™s beauty and on-stage rapport, combining confidence, sincerity and a touch of sass, have captivated fans in more than 15 countries. R&B solo artist, jazz violinist and former lead singer for the Village People, Miles Jaye, opens the evening serenading sweethearts with his top hits “Let’s Start Love Over” and “I’ve Been a Fool for You”, which became Top 10 singles on the Billboard R&B charts in the late 1980s. Tickets are $35, 45, and 60 at Miramar Cultural Center, 2400 Civic Center Place, Miramar FL 33025; order at miramarculturalcenter.org or call (954) 602-4500. Courtesy KCC Productions. Daughter of TV royalty Lucille Ball & Desi Arnaz, Lucie Arnaz performs a fiery, explosive and heartfelt musical tribute to the rhythm of her roots and a love note to her father. Latin Roots is an eclectic Latin American mix in English and Spanish that sizzles with sophistication and sassy spice to songs from Cole Porter, Irving Berlin, Johnny Mercer and Desi Arnaz, himself. It’s official! DanceAfrica Miami returns to South Florida for the first time since 1997 and will make its debut at the 7th Annual African Diaspora Dance and Drum Festival of Florida on August 6th presented by Delou Africa. New Yorkâ€™s Forces of Nature Dance Theater is the headlining performance. Raffle drawing for 2 tickets to South Africa courtesy of South African Airways. On Saturday, July 16, join us for a â€œBrunch and Bowl to Strike out Bullyingâ€ networking event in order to raise money to send 130 high school students to NVEEE’s Peace Ambassador Leadership Summit (PALS). Whether you are a young professional just entering the workforce, or someone more seasoned and ready for retirement, we can all agree on one thing, BULLYING HURTS and it has a lifetime effect on everyone involved! This is an opportunity for you to make a difference in the lives of teens by connecting with other professionals and networking for a good cause. You may donate to a team to help raise money even if you’re not able to attend by simply clicking “Donate” instead of “Join”. All donors will be prompted to create a free account, and even if you’re not attending it will ask for your shirt size. If we have any left over shirts you might receive a surprise in the mail. Your donation will help cover the cost of housing, meals, t-shirts, and tuition for at-risk and low income students to attend PALS; a 10-day leadership conference for students who commit to being upstanders instead of bystanders when it comes to bullying and harassment. Whether students are looking to expand their leadership and social skills, learn peer mediation, enhance their public speaking and job interviewing ability, learn to write an impactful resume or to simply develop conflict resolution skills, PALS is here to help students obtain all of those skills in a safe space among a diverse group of their peers. More importantly, all students will practice showing empathy, tolerance, and respect for others. To learn more about PALS, visit www.PALSconference.org. The Miramar Cultural Center will celebrate Hispanic Heritage Month with a tribute to Latin and Classical music presented by MAR Communications & Services, Inc. Famed pianist, Thomas Tirino will interpret the music of Ernesto Lecuona in â€œLecuona, His Music, His Legacy.â€ The event, part of the LatinSymphony concert series, will take place on Saturday, October 3, 2015, 7 p.m. at the Miramar Cultural Center. Thomas Tirino is recognized worldwide for his skillful interpretation of the music of Cuban composer Ernesto Lecuona. Tirino is the driving force behind the revival of many of Lecuonaâ€™s masterfully crafted compositions such as â€œDamisela Encantadora,â€ â€œMarÃ­a La O,â€ â€œMalagueÃ±a,â€ â€œRapsodia Negra,â€ â€œEstÃ¡s En Mi CorazÃ³nâ€ and many more. A graduate of the Juilliard School of Music, Tirino has performed concerts and given master-classes and lectures on Lecuonaâ€™s music all over the world, and has recorded several albums with the music of Lecuona. Born in Guanabacoa, Cuba, Lecuona composed over six hundred pieces, mostly in the Cuban vein. His talent for composition influenced the Latin American world by raising Cuban music to classical status. At â€œLecuona, His Music, His Legacy,â€ audiences will be transported on a memorable musical journey filled with nostalgia for Cubaâ€™s glory days. There is no one more appropriate to serve as master of ceremony than Nestor Rodriguez. Born in a Cuba to a musical family, Rodriguez was president of Classical South Florida. He has spent his career dedicated to furthering the arts by devoting his time and resources to non-profit organizations such as the Miami City Ballet, Florida Philharmonic Orchestra and the Chopin Foundation. As master of ceremony he will provide the audience with a special treat before the show conducting a special interactive Q&A with Tirino. Tickets to â€œLecuona, His Music, His Legacyâ€ are currently on sale and range from $55 – $90. Visit miramarculturalcenter.org to purchase tickets in advance or click here. Miramar Cultural Center box office contact number: 954-602-4500. MAR Communications & Services Inc. is the creator of LatinSymphony, an annual event that celebrates the fusion of Latin and Classical music. For information surrounding MAR Communications & Services Inc. and upcoming musical events, please visit: http://www.marcommunicationsandservicesinc.com. Several important items are missing from our beloved fairytales! Gordon Gumshoe needs his audience of junior detectives to help him find clues and solve the case. This fun family show encourages literacy. Cost: Tickets are $50 in advance and will be $60 the day of. In order to purchase tickets, please visit the Jazz in the Gardens official website: www.jazzinthegardens.com. Refunds will not be available. The City of Miami Gardens presents the annual Jazz in the Gardens Pre-Party at the Miramar Cultural Center, at 7:30 p.m., on Friday, March 20, 2015. The Rickey Smiley Morning Show will host the evening of music and comedy on the plaza, featuring Rickey Smiley, Claudia Jordan, Gary Wit Da Tea, Special K, Lavar Walker, and Cory Zooman Miller, and live performances by the DMC Band. No Coolers, glass bottles, personal fireworks or animals will be permitted into the event area. Regardless of the weather, the event will take place. 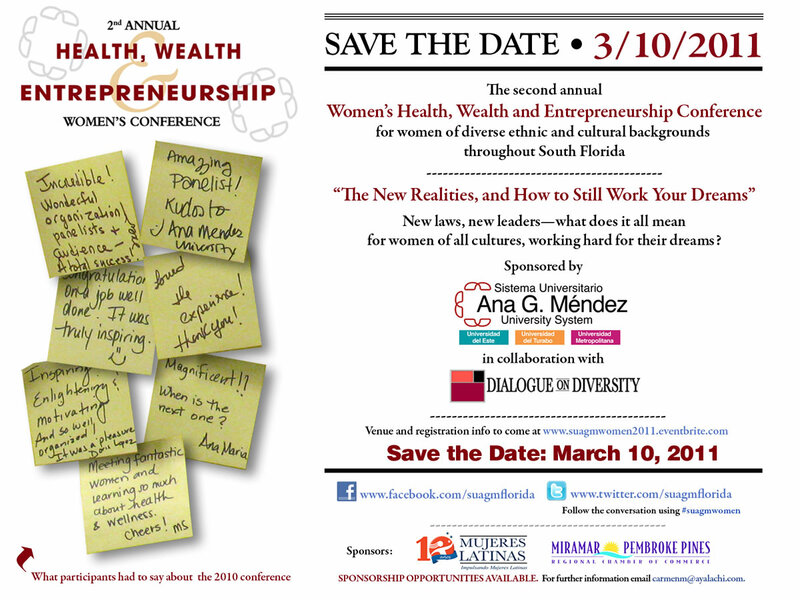 In honor of Women’s History Month and in conjunction with the 10th Annual Jazz in the Gardens Music Festival, the City of Miami Gardens will host the 2015 WOMENâ€™S IMPACT CONFERENCE & LUNCHEON. Originally created in 2010 by Former City of Miami Gardensâ€™ Mayor, Shirley Gibson. At the conference, women of varied races, creed and cultures are exposed to ideas and strategies for how to take time for self-discovery; essential activities associated with inspiration and motivation; and encourage women to live centered and complete lives by taking advantage of all of life’s endless possibilities. Attendees will be entertained and engaged, as distinguished experts deliver powerful tips, tools and information on topics to inspire women. This highly anticipated, and usually â€œsold-outâ€ event, will take place at the beautiful property of Miramar Cultural Center, Miramar Florida from 8:00 am â€“ 4:00 pm on Friday, March 20th, 2015. In recognition of Alonzoâ€™s recent appointment to President Obamaâ€™s Council on Fitness, Sports and Nutrition, Zoâ€™s Family Health & Wellness Groove invites families to converge on Miramar Regional Park for events such as a Foot Locker 5k run/walk, health screenings, fun zones, mini sports clinics (football and basketball) and fitness classes. The event is FREE, open to the public and will be full of activities built around supportive programming for families, including healthy living, arts, crafts, and an array of activities for kids of all ages. Led by former Miami Heat superstar and 2014 National Basketball Hall of Famer Alonzo Mourning, The Mourning Family Foundation (MFF) and Carnival Cruise Lines will present the first annual Zoâ€™s Winter Groove (ZWG) â€“ the sister event to Zoâ€™s Summer Groove of years past â€“ powered by Foot Locker. The three-day â€œGrooveâ€ will feature a family day of Health & Wellness, Comedy Show, and Golf Tournament, hosted by Alonzo and Tracy Mourning. Join us at the Beauty and Wellness Red Carpet Event and Fashion Show on Saturday, October 19, from 1:00 p.m. to 6:00 p.m. for an afternoon of beauty, fashion, great raffle giveaways, and fun featuring a live extreme makeover and a fashion showcase by designers JB Couture by Judith Barnes and Henrry Meza Designs celebrating Breast Cancer Awareness Month. Early bird tickets are $10, and general admission is $15. Event is held rain or shine. Exhibit Vendor Tables are available. Please contact Fatima Coello at 305-753-1224 or Aida Vilches at 786-454-6385 to reserve. Join our Executive Director Chief Nathaniel B. Styles Jr., as he brings Esther Anderson to Miramar Cultural Center Arts Park, to celebrate Caribbean America Heritage Month! The film shows the Wailersâ€™ first rehearsal, the launch of their international career with Get Up, Stand Up, I Shot the Sheriff and more! Based on footage shot in the early seventies and lost for more than thirty years, NAACP Image Award winner Esther Anderson takes us on a journey to Jamaica and into 56 HOPE ROAD, Kingston, to see and hear the young BOB MARLEY before he was famous. The screening will be followed by a Question & Answer session with Actress/Producer/Filmmaker Esther Anderson and co-host High Chief Nathaniel B. Styles Jr. 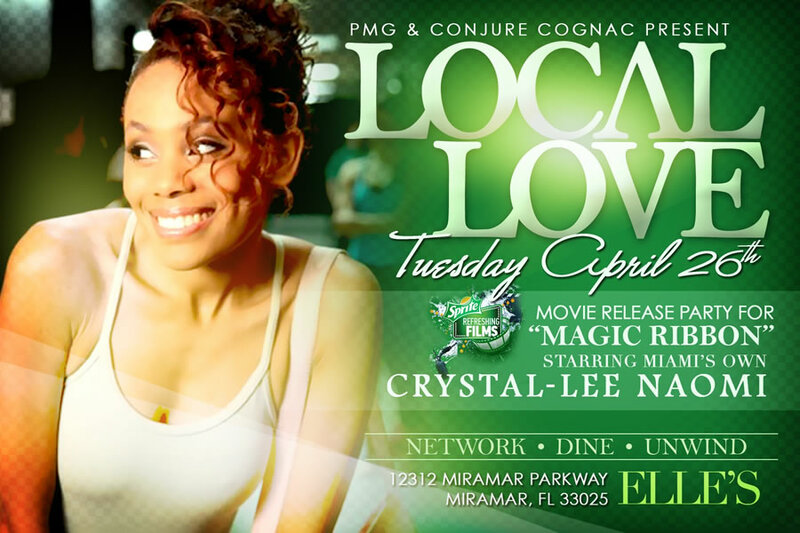 The evening will be hosted by Hot 105â€™s Tanto Irie of Reggae Runnins! Tour de Broward offers a variety of unique activities that give everyone a chance to participate in the event of their choice. Cyclists can participate in a 50k or 100k ride, runners can sign up for a timed 5k, and families can do the 3K walk/run together. The event also features a Power of Play Kid Zone where children get the chance to participate in sports related activities, interactive games and more. Tour de Broward will take place at Miramar Regional Park, from 7am to 1pm on Sunday, February 24th. 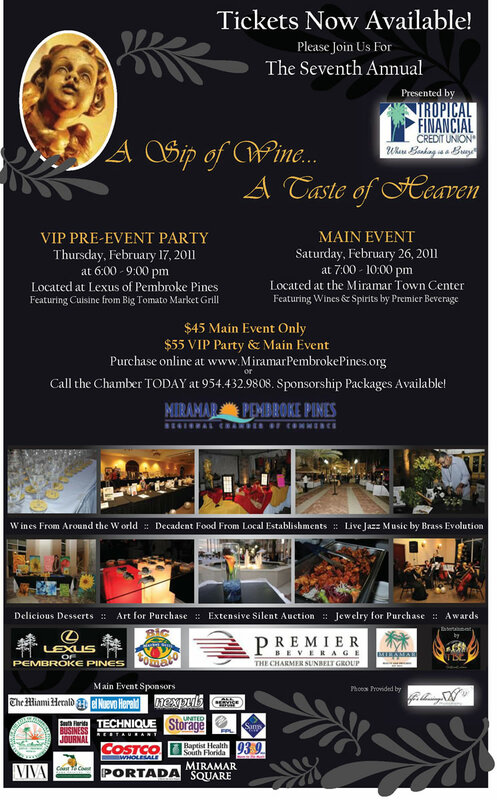 Tickets range from $10-$40 and participants can register online at http://www.kintera.org/faf/home/default.asp?ievent=1042874. For more information on the organization visit http://www.tourdebroward.com. Heâ€™s making a list and checking it twice and kids in South Florida will have a chance to show him theyâ€™ve been extra nice â€“ Santa Claus is coming to town! The jolly man in red is making a special appearance at select Winn-Dixie stores. Children will have the opportunity to have their photo taken with Santa, as well as enjoy milk and cookies, festive food tastings, giveaways and more. Yesterday I was headed to Home Depot to buy a new garbage disposal. Yeah, I know. Saturday Fun Day! On the way across Miramar Parkway, I saw some of those digital signs set up by the police, advertising a meet Sheriff Al Lamberti and Chief Keith Dunn event at Super Target. My kids read the sign too and asked if they could go, mainly so they could chat about Pokemon cards inside. And I said OK. I guess the point of an event like this is to showcase the local and county police departments, while being accessible to the community citizens in a fun and easy-going environment. On the far side of Target’s parking lot was a pretty impressive display of police talents and vehicles. I personally loved the old-fashioned Miramar police car (and its engine). Yes, a cop was stationed next to it supervising. The sports car and souped-up muscle cars revving were also pretty cool. There were also children painting a fire truck right next to it. Moving on, my children both loved the opportunity to sit in the driver’s seat of a Broward Sheriff’s helicopter! We learned about the bomb squad robot and were able to control the camera on it. Anyone for a chance to stand on and poke your head out of a Swat Team armored vehicle? Damn Straight! Mounted Police? Yeah, but for some reason my kids didn’t want to rub the horses’ heads. We were on our way inside when we saw that Target had a person dressed like their mascot Bullseye. My little one ran away from it (like he did to Chuck E Cheese today), and when the mascot threw its arms up in disbelief, I gave it a big hug! I think that shocked the dog! Also shocking, my children skipped the free cotton candy. Hmmm. Very fun. Inside, some informational booths, some chicken by Chick-fil-A, and a bunch of media stuff. You never saw so many police officers in one place. Good thing they were all so friendly. Nice impromptu (for us) event. Sat., June 30, from 11 a.m. to 1 p.m.
To kick-off summer, Winn-Dixie invites the community to learn creative, fun and exciting new grilling ideas that will turn any cook into a BBQ super star! Shoppers will have a chance to enter a raffle for the opportunity to win a delicious three course Caribbean Grill meal, prepared during the event by Miramar Winn-Dixie Chef Rey. 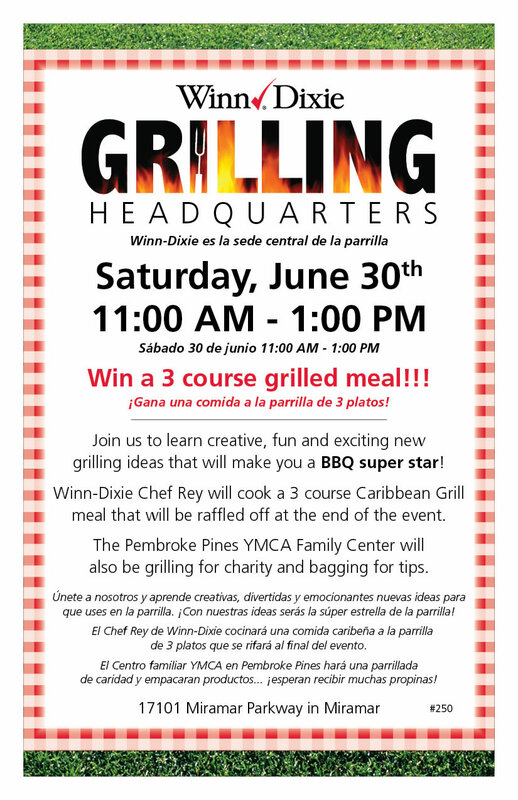 The Pembroke Pines YMCA Family Center will also be on-site, grilling food and bagging groceries for charity. Children can enjoy face painting, summer safety tips and more. Vizcaya Park in Miramar was officially opened this past weekend. I’ve been chronicling the park’s construction over the past few years, as it’s been turned from a desert where we used to fly kites to the awesome park it is today. And these past few years are just the tip of the waiting. For a decade or more, including all the time I’ve lived in the nearby Vizcaya community, Commissioner Troy Samuels has been pushing for the creation of this park. On Saturday, he got his wish as Mayor Lori Moseley opened the park with a ribbon-cutting ceremony. Vizcaya Park is located at the end of Honey Hill Road, west of Flamingo, 14200 SW 55th Street, right on the county line. There are several fields for soccer and baseball, playgrounds, basketball courts, and a community center. The Mayor explained that the building and entire facilities were made to be on the cutting edge environmentally. The building, for example, was built with 20% recycled materials, and the fields and drainage systems were designed to maximize water usage. I personally can’t wait to visit frequently, probably to use the game room and beat my kids in foosball. There are banquet rooms available and a computer room as well. And there will be some clubs and summer camps meeting there. Here is the website for Miramar Parks in general, as I didn’t see that the park has its own website yet. The number to call for more information about Vizcaya Park, according to the resident letter, is (954) 602-3167. 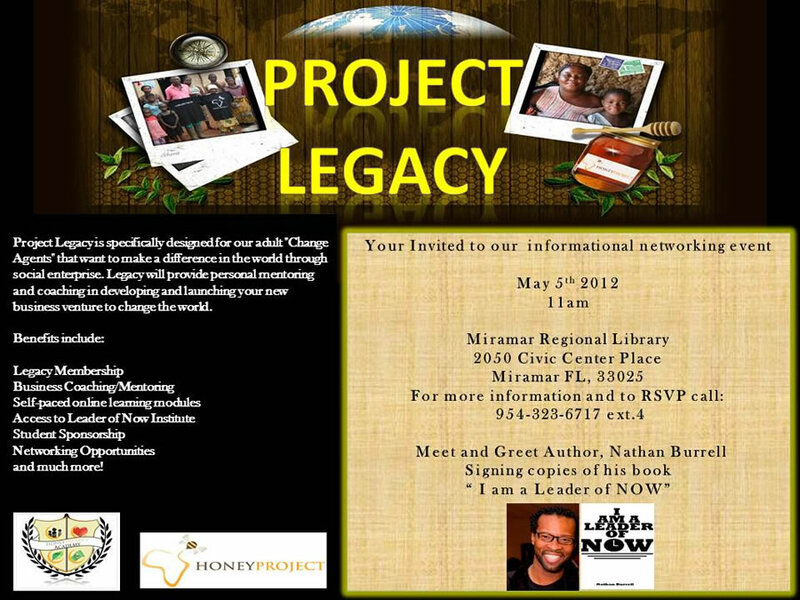 Join The Honey Project to create and leave your Legacy. Experience a motivational and inspirational seminar on how to launch your new business now and pursue your dreams. The Smith-Magenis Syndrome (SMS) Research Foundation, a 501(c)(3) organization, hosts the Third Annual Siennaâ€™s Steps 5K Run/Walk. The 5K run/walk course is USATF certified and will be officially timed by Split Second Timing. Awards will be presented to winners in each age division for both male and female. The event, sponsored by Memorial Hospital Miramar, will be Emceeâ€™d by EO Entertainment and include breakfast for all participants immediately following the race. Each pre-registered participant will receive a t-shirt and goodie bag. Race fees are $25.00 for pre-registered participants and $30.00 for race day registration. To register for the 5K Run/Walk please visit www.siennasteps.com or www.SMSResearchFoundation.org. Participants can also set up an individual fundraising page for the 5K Run/Walk by clicking on â€œBecome a Fundraiserâ€ during the registration process. For any questions, please call Missy Longman at 305.525.9678. Participants are encouraged to pre-register. Pre-registered participants can pick up their packets on Friday, May 17th at Runnerâ€™s Depot located in the Promenade Plaza at 2233 South University Drive, Davie, FL 33324. Participants can also pick up their packets at the race location the morning of the event. Same day registration begins at 6:30 am and will conclude at 7:15 am. The race will begin promptly at 7:30 am. Sienna Rose, daughter of Missy and Dan Longman, was born on May 21, 2006. After undergoing open-heart surgery at just four weeks old, she was diagnosed with a rare and chromosomal disorder called Smith-Magenis Syndrome (SMS). Since then, Sienna has undergone eight more surgeries for various medical complications associated with the syndrome. She maintains a daily routine of intensive physical, occupational and speech therapies. Siennaâ€™s parents, along with Jennifer and Chris Iannuzzi, whose daughter was also diagnosed with SMS, founded The SMS Research Foundation in June 2010. The Foundationâ€™s mission is to improve the knowledge and understanding of SMS so that viable therapeutic options can be developed to improve the quality of life for those diagnosed with SMS. The SMS Research Foundation awarded their first grant of $50,000 on May 1, 2011. Smith-Magenis syndrome (SMS) is a chromosomal disorder characterized by a recognizable pattern of physical, behavioral, and development features. It is caused by a missing piece of genetic material from chromosome 17. It is estimated that SMS occurs in 1 out of 25,000 births. SMS is under-diagnosed, but as awareness increases, the number of people identified grows every year. To learn more about the SMS Research Foundation, please visit www.SMSResearchFoundation.org. This Sunday, April 8, 2012, Calvary Fellowship will host Miramar’s Largest Easter Egg Hunt.Â In fact, they will hold two Easter Egg Hunts, one after each service. An iPod Touch will be given away at both hunts as well, which is pretty cool. The egg hunts take place following both the 10 am and 1130 am services. Here is the invitation to both the service and the egg hunts. Calvary Fellowship services take place at Everglades High School, 17100 SW 48 CT, Miramar FL 33027. I’ll be there and promise to post some pictures here afterward. Complete Taxes and Services will host a â€œCommunity Dayâ€. 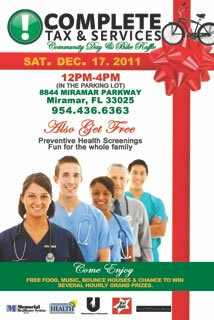 Complete Taxes and Services has partnered with Broward County Health Department and Memorial Health Care Services to provide a free mini health clinic that will consist of free testing and screenings. There will also be a kids zone that will include a bounce house, cotton candy, face painting and music. In addition Reaching U Network Inc. will provide information about how to help individuals that are facing foreclosures. Complete Taxes and Services is full service professional tax office that provides an extensive range of tax services and solutions to their clients. They have earned a reputation for quality, reliable and personal service. Complete Taxes and Services is small enough to respond the individual needs of their clients, yet possess the resources needed to handle the most complex and sophisticated tax challenges that their clients may be faced with. They are excited about to be entering into their second year of servicing the City of Miramar community and look forward to really connecting with our surrounding community with additional community events through the 2012 tax season. 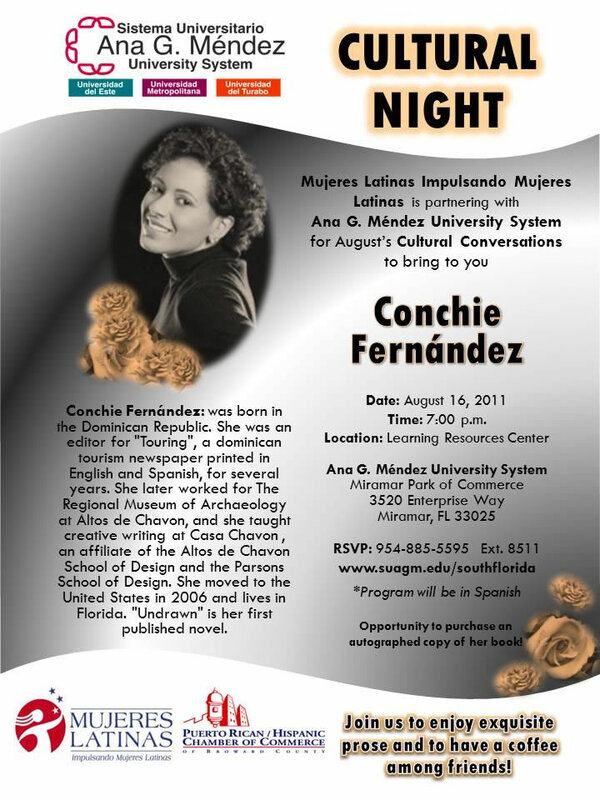 Join us for “Undrawn”‘s official launch on Aug. 16, 2011, hosted by Ana G. Mendez University System and “Mujeres Latinas Impulsando Mujeres Latinas”. The author will read an excerpt of the book and sign copies. SUAGM Celebrates National Library Week 2011! On Saturday, May 21, 2011, the Smith-Magenis Syndrome (SMS) Research Foundation, a 501(c)(3) organization, will host the Second Annual Siennaâ€™s Steps 5K Run/Walk at Memorial Hospital Miramar. Sienna Rose, daughter of Missy and Dan Longman, was born on May 21, 2006. After undergoing open-heart surgery at just four weeks old, she was diagnosed with a rare and chromosomal disorder called Smith-Magenis Syndrome (SMS). Since then, Sienna has undergone eight more surgeries for various medical complications associated with the syndrome. She maintains a daily routine of intensive physical, occupational and speech therapies. Siennaâ€™s parents, along with Jennifer and Chris Iannuzzi, whose daughter was also diagnosed with SMS, founded The SMS Research Foundation in June 2010. The Foundationâ€™s mission is to improve the knowledge and understanding of SMS so that viable therapeutic options can be developed to improve the quality of life for those diagnosed with SMS. On Saturday, May 21, 2011, the Smith-Magenis Syndrome (SMS) Research Foundation, a 501(c)(3) organization, will host the Second Annual Siennaâ€™s Steps 5K Run/Walk at Memorial Hospital Miramar located at 1901 Southwest 172nd Avenue in Miramar. The 5K run/walk course is USATF certified and will be officially timed by Split Second Timing. Awards will be presented to winners in each age division for both male and female. The event, sponsored by Memorial Hospital Miramar, will be Emceeâ€™d by EO Entertainment and include breakfast for all participants immediately following the race. Each pre-registered participant will receive a t-shirt and goodie bag. Race fees are $25.00 for pre-registered participants and $30.00 for race day registration. To register for the 5K Run/Walk please visit www.siennasteps.com or www.SMSResearchFoundation.org. Participants can also set up an individual fundraising page for the 5K Run/Walk by clicking on â€œBecome a Fundraiserâ€ during the registration process. 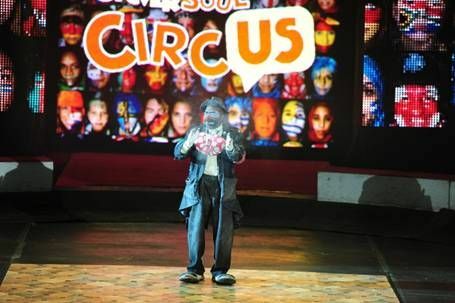 The person who raises the most money will be awarded with a suite for the Alegria Cirque du Soleil performance at the BankAtlantic Center which includes 24 tickets and underground VIP parking. For any questions, please call Missy Longman at 305.525.9678. Participants are encouraged to pre-register. Pre-registered participants can pick up their packets on May 20th at Runnerâ€™s Depot located in the Promenade Plaza at 2233 South University Drive, Davie, FL 33324. Participants can also pick up their packets at the race location the morning of the event. Same day registration begins at 6:30 am and will conclude at 7:15 am. The race will begin promptly at 7:30 am. Sienna Rose, daughter of Missy and Dan Longman, was born on May 21, 2006. After undergoing open-heart surgery at just four weeks old, she was diagnosed with a rare and chromosomal disorder called Smith-Magenis Syndrome (SMS). Since then, Sienna has undergone eight more surgeries for various medical complications associated with the syndrome. She maintains a daily routine of intensive physical, occupational and speech therapies. Siennaâ€™s parents, along with Jennifer and Chris Iannuzzi, whose daughter was also diagnosed with SMS, founded The SMS Research Foundation in June 2010. The Foundationâ€™s mission is to improve the knowledge and understanding of SMS so that viable therapeutic options can be developed to improve the quality of life for those diagnosed with SMS. The SMS Research Foundation will award their first grant of $50,000 on May 1, 2011. 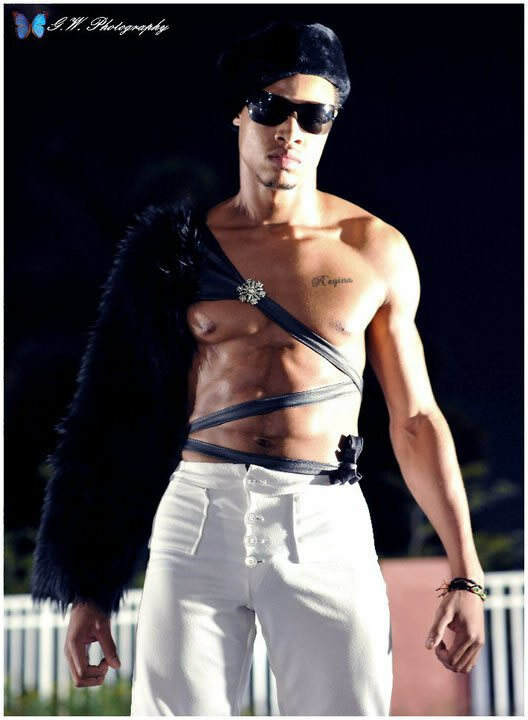 The hottest fashion show in town is scheduled to splash down August 26th & 27th. For 6 years in a row audiences have OOH’d and AWW’d at the amazing designs, performances and deals at vendor’s tables. This year the spectators are begging for more. The 7th annual Fashion Splash is seeking designers, talent, sponsors and vendors. For more information and packages email TesiaPoulos@FirstClassProductionsInc.com or surf your way over to WWW.FirstClassProductionsinc.com & www.fashionsplash.webnode.com for footage and photos from prior shows. Don’t let this opportunity slip away. 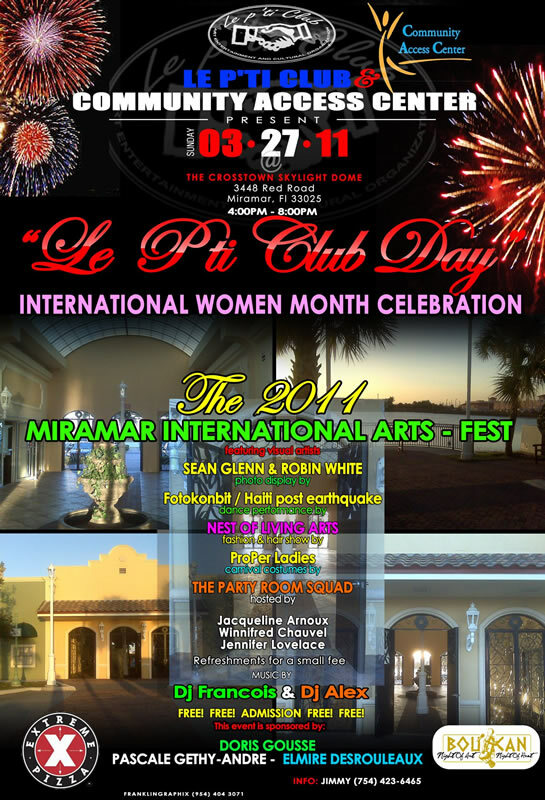 LE Pâ€™TI CLUB arts, entertainment & cultural organization (non-profit) will commemorate the 1st Anniversary of â€œLE Pâ€™TI CLUB DAYâ€ in Miramar. This day was proclaimed by Miramar Mayor Lori Moseley last year. This yearâ€™s celebration will take place on Sunday, March 27, 2011 at the Crosstown Skylight Dome, located at 3448 Red Road, Miramar, FL 33025. In collaboration with the Community Access Center, this event will increase the awareness of the connection between community and culture, and how the arts plays an important role in creating a wonderful bridge between both. Artists will exhibit and perform during the event. There will be also the Haiti post-earthquake photographic display by Fotokonbit. Le Pâ€™Ti Club will also present an exciting calendar of events slated for 2011. Support and participation from the community is strongly desired. This is a free event and all are welcomed. Sign Up For Our Early Bird Special For $25! Registration is $50 per person in advance or $65 at the door. It includes a full-day attendance, continental breakfast and box lunch. The conference features four sessions that will offer a mix of practical advice, audience discussions and uplifting messages. Experts in health, wealth, entrepreneurship and technology will lead the conversations. – Taking the pulse of health news stories: What’s hype, what’s hope? – Can you believe in what your mammogram tells you? – A mattress for your money: Is the lack of interest by the banks killing your savings? Where to turn. – What kind of economy is going to emerge? How can we position for success? – How we grew (census): Florida gains seats. Economic Implications. – Adding another E to H, W, E: How new technologies are turning the virtual into what works for your health, wealth and entrepreneurship. Thursday, March 10: this date is for YOU! Our experts will share the answers to the 10 Most Important Questions for Women in 2011 and more. Save the date January 8, 2011 for the recruitment seminar at the Hampton Inn & Suites 10990 Marks Way Miramar, Fl 33025 1pm-4pm for aspiring models ages 3-38 and models with curves sizes 12-24. Are you the next Miss Runway in your age division? Do you have a signature walk? are you able to rip the runway? are you able to showcase the best beach, creative/fantasy and evening wear? are you ready to win the title, crown, sash, trophy, all paid expense professional photo shoot, the opportunity to model in or attend New York Fashion Week, compete in Hairtopia Model Search Miami and DC, casting updates, entry in the perfect picture photo contest for mini, tiny and tween divisions, fabulous prizes and receive tons of exposure with some paid bookings? Then send your name, age, contact number and two photos to missrunwaycompetition@yahoo.com and join the network site to receive updates on the current winners at www.missrunwaycompetition.ning.com. There is no fee to attend the recruitment seminar, however fees are required to enter the competition during the open casting.Fees will be discussed during the recruitment seminar or you may contact our office at 800-490-9632 Ext to speak with the Director Sunnie Morrison. You will meet and greet current and past winners, witness a fashion show featuring the winners, see video of miss runway 2010 and compete in runway wars to win a $20 voucher for the entry fee in the competition. 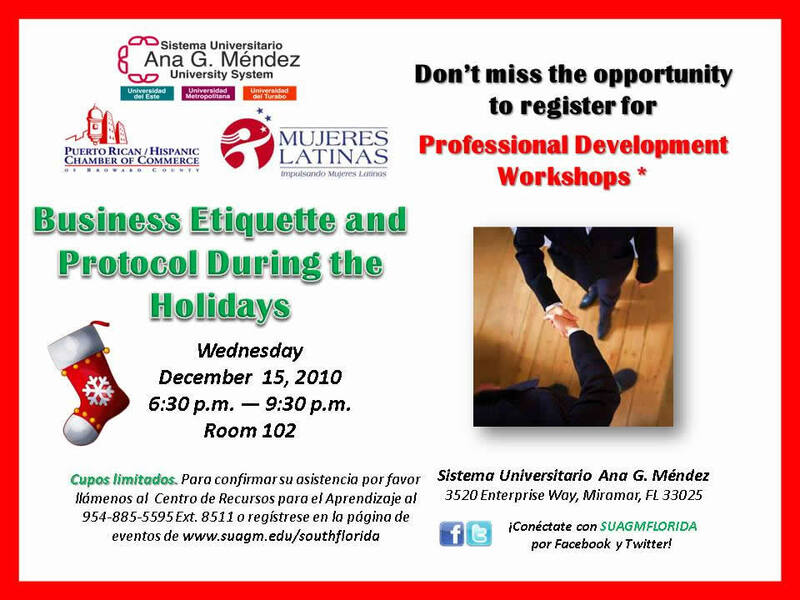 December 15, 2010, 6:30 p.m. â€” 9:30 p.m.
Donâ€™t miss the opportunity to register for Ana G. MÃ©ndez University Systemsâ€™Professional Development Workshops! 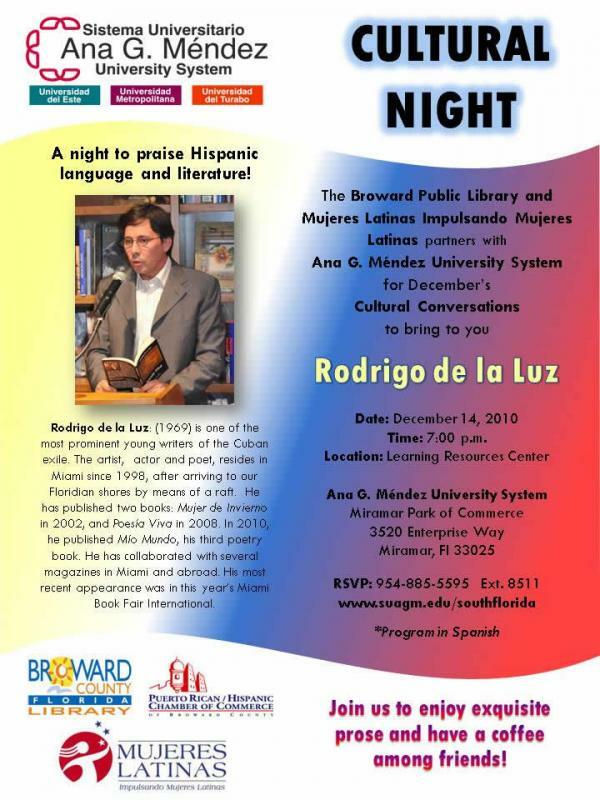 Rodrigo de la Luz young writers of the Cuban exile and he will vising our campus to share his publications and talk about the beauty of hispanic language and literature. Please join us to enjoy exquisite prose and have a coffee among friends! 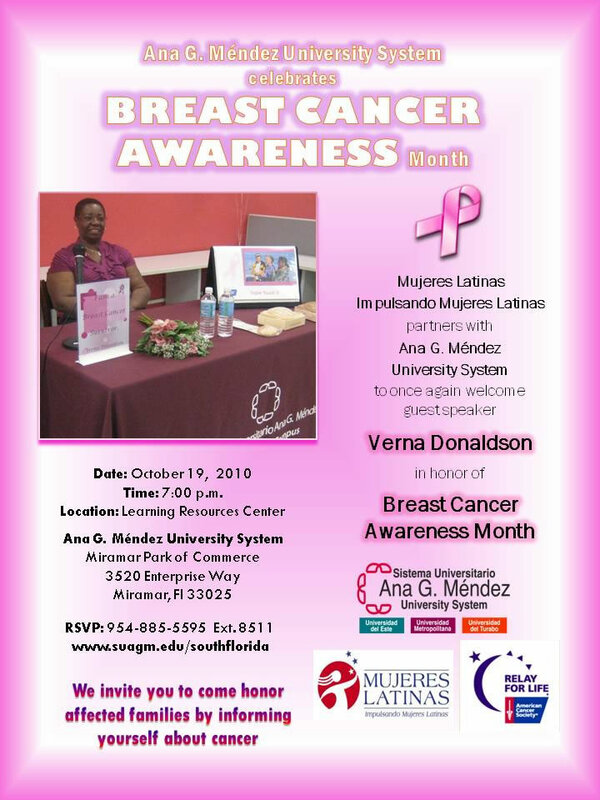 Ana G. Mendez University System invites cancer survivor Verna Donaldson to come educate our audience about breast cancer prevention, thru her own experience. She works with the American Cancer Society helping affected patients. 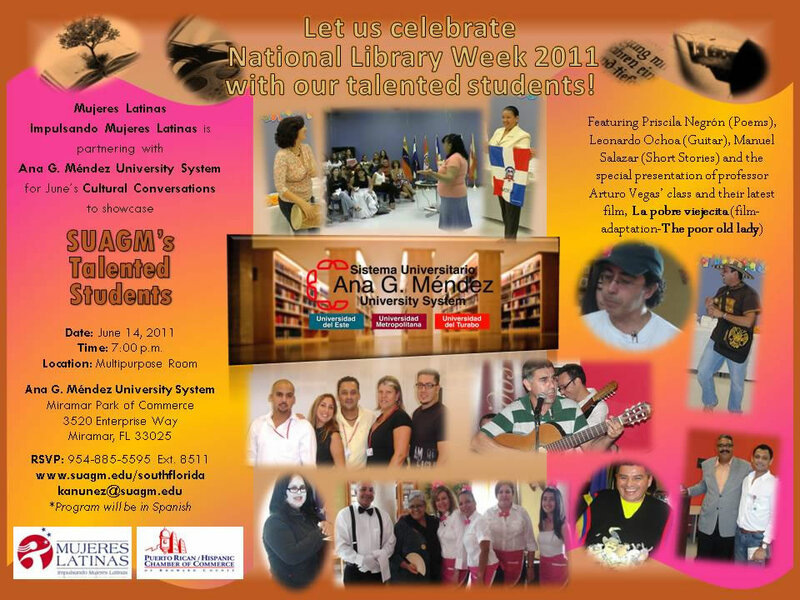 She will visit the Learning Resources Center at our Miramar Please join us!